Who doesn't want a domain.com instead of www.domain.com? and why not force SSL to everyone too? due the misinformation found around the internet, look and understand here a definitive solution to both problems. Naked domain is a domain without the subdomain, like subdomain.domain.com or whatever.domain.com, due to this short name, it's the preferable way to show and spread domains names actually. Another desirable thing is force the SSL / HTTPS always, in other words, if someone access your domain with http://domain.com or http://www.domain.com or https://subdomain.domain.com they all should be redirected to https://domain.com. 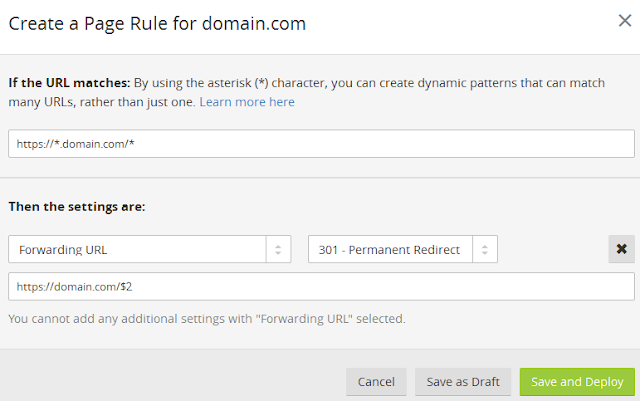 But naked domains seems to have some kind of limitation due the RFC (when was created the rules about DNS names etc ~1987), so you should use a subdomain.domain.com, but CloudFlare use a technique called CNAME flattening (details here) which allows the use of naked domains anyway. 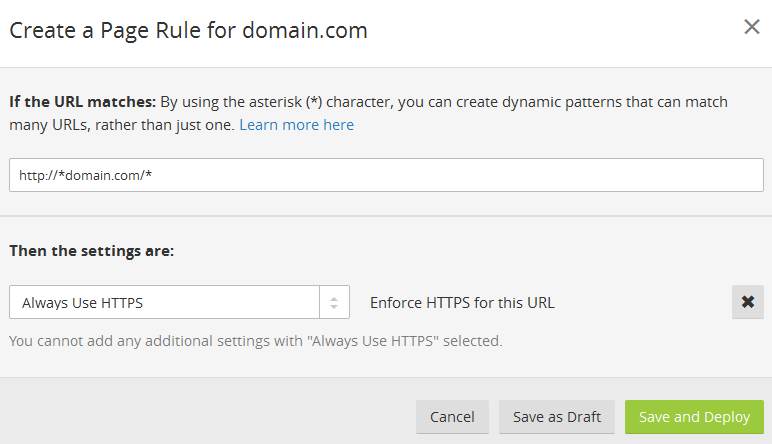 At this point any requests will have the https://<anything>.domain.com/<anything> format, so what this rule does is ignore the first <anything> (which is the subdomain) and convert the request to https://domain.com/<anything>. The $2 gets the second wildcard data from the first field.